More stories from the November/December 1969 issue of "Beatles Rule" fan club newsletter. These are short, so I am going to put them all in one post. I met Paul 10 times!! I can hardly believe it myself. He was here in March with Linda and Heather. 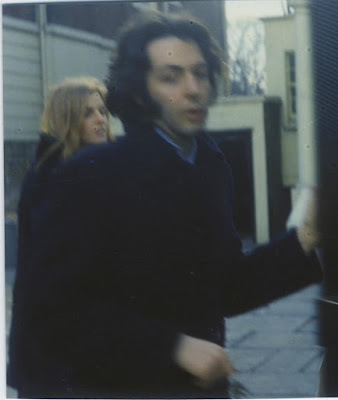 We found out and went down to Linda's apartment on March 18 (1969). After waiting for eight hours we MET him!! I was able to kiss him. After that, we went home. The next morning he left for the Bahamas for a brief honeymoon. They returned the following week. And once again we went down to the apartment on Lexington Avenue. But this time, we decided we weren't leaving -- not until he did! So we stayed for three days! It was well worth it. I got his autograph on my favorite picture of him. You'll never guess which one. The Fool on the Hill picture I got from Beatles Rule! I have it framed. It's so beautiful. On Sunday, March 30, he came home at midnight -- drunk! Linda had to hold him up! It was a riot! He was singing "Hey Jude" all off-key and staggering all over. all the time he was friendly to us. And when he left on Monday the 31st, it was so sad. He said he loves us all. We cried so much. Seven weeks in England makes one realize a number of things: It's too easy to get in the habit of seeing The Beatles every day and too hard to face reality when the dream ends. I can't linger on the thought for long because it blows my mind. Remember all the hours of waiting, waiting...just to spend the minute or two in his presence. Paul. But each few minutes strengthens the realisation that all the waiting is worth the freezing hands, numb feet, silent tears, cop dodging, and other miserable circumstance. worth so much more dear friends. I can't give all the details of my trip, but I will try to choose a couple of incidents that will be of interest to you. One day precious Paul, wife Linda and dog Martha came out for a walk. Paul was in a good mood, smiled and said hello. then a girl named Pat and I followed them (we were on the opposite side of the street) for about three blocks. At a busy intersection Martha was determined that she was gonna run out into the traffic, so Paul put his legs on either side of her, held onto the collar, and nearly sat on her! It was ever so sweet. Another day Paul and Linda got home after being out in their green mini. Someone had thrown a girl's purse into Paul's yard and she told him about it as he got out to open the gate. After getting the facts straight (who threw it? "Where did he throw it?") He went in and we could hear him kicking around in the leaves. "No--can't find anything here..." he finally shouted from the other side of the wall. I saw all four, by the way. Also Yoko, Maureen, Zak, Jason, Pattie, Heather, Mr & Mrs. Graves (Ringo's mom and stepdad), Neil and Mal, Freda Kelly, Krishna Temple, Mary Hopkin, Jackie Lomax, and many others. Well--with that I'll leave you. 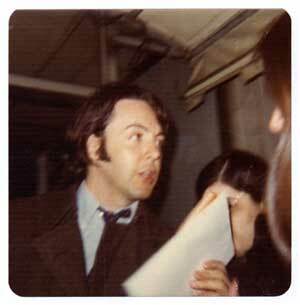 sorry that I'm so Paul biased. Take that back--I'm not sorry at all! He's a beautiful man.